That’s what happens when you don’t pay the light bill, Washington Nationals. You can’t play sports without lights these days. The days of the day game have come to an end, and while day games are still fun on weekends or on a holiday, most of your major game time is going to be spent under the lights, assuming those lights actually work. When the lights go out, the game stops, no matter what sport you’re playing. Nationals Park in Washington, D.C., was the scene of one of those rare sports blackouts. 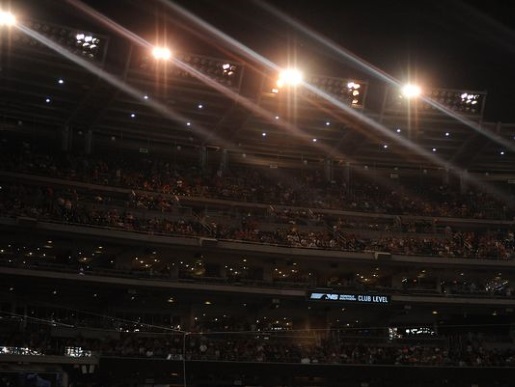 Friday night’s game at Nationals Park was called off after the outfield lights went out. At the bottom of the fourth inning, the Dodgers led the Nationals 2-1. Then, four blocks of lights went out above the field. After a delay of 82 minutes, play picked back up for another 9 minutes and then, boom, lights out again. That caused another 40 minute break before officials called the game off. Now the Nats and Dodgers will play a double-header; the remaining five innings of Friday’s game, and a second game. Hopefully, they’ll have a collection of back-up lights at the ready.